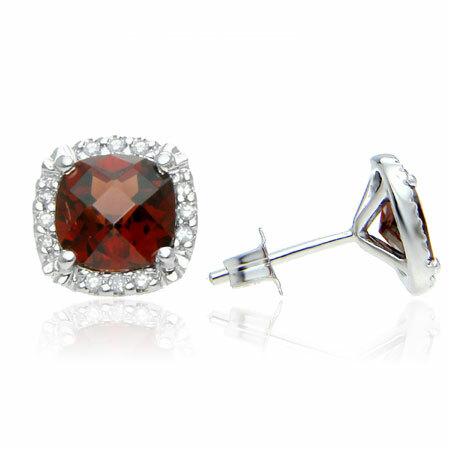 Crimson color, cushion-cut garnet earrings that denote class and exquisite taste. The style maintained throughout complements the 925 sterling silver base with its scalloped edges and flowing impression. It also sports a tripod which is made of sterling silver and rests on single strand holding the clasp at its end. The tripod supports a base fashioned from sterling silver and houses the cushion-cut garnet which measures 6mm x 6mm in size with 1.92 Carats. Firmly holding the crimson gemstone in place are four stylish clasps attached to the base while it is surrounded by 0.12 Carat diamonds, numbering 24 with a combined shimmer giving the halo effect to the sud earrings. We guarantee our Cushion-Cut Garnet and Diamond Halo Stud Earrings in Sterling Silver to be high quality, authentic jewelry, as described above.